Recently I started a writing job for a healthcare company, and as a result I have had to look very carefully at the healthcare industry. By coincidence, I also had a medical issue which landed me in the hospital (I am now alright), and gave me a much deeper insight then I expected. Especially, when I got the bill. 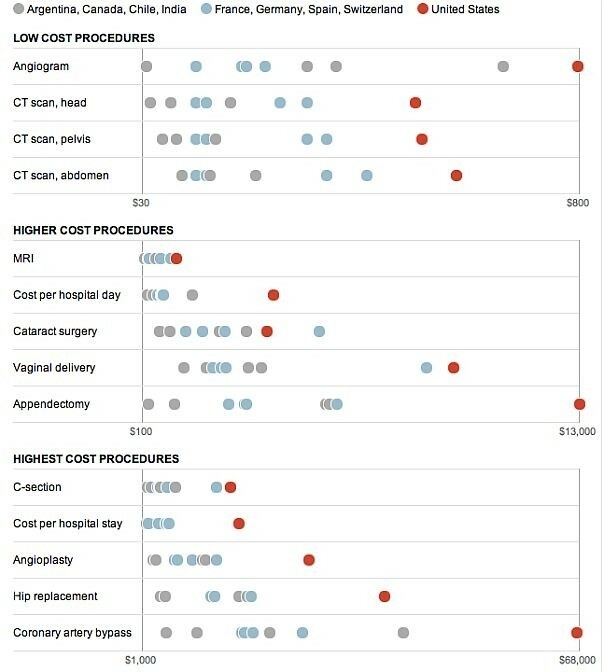 Everyone says that US Healthcare cost are too high. OK, what evidence is there to support that statement? This chart shows that our healthcare costs are the highest in the world, as a % of GDP, we are about 6% more then the next highest – France. When you map it on a graph, you can see the USA is way above the average by a large amount. 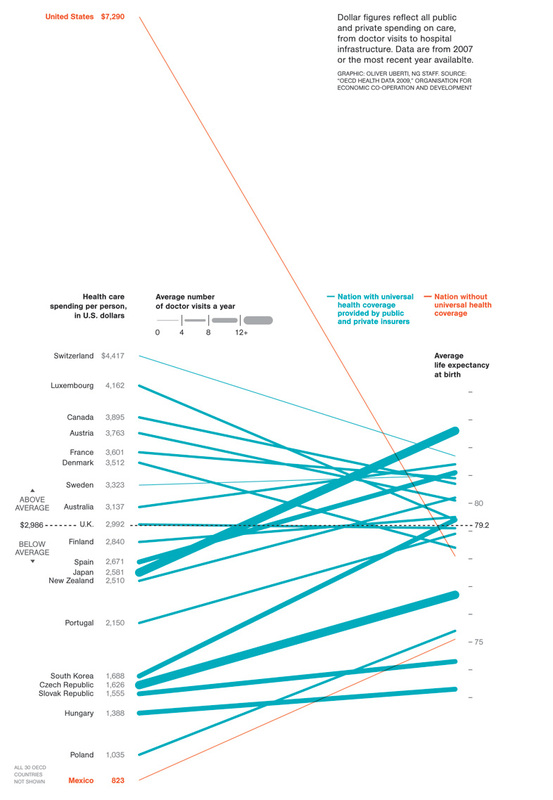 US citizens spend a much larger percent of their incomes on healthcare, then another country. In addition to higher health spending, the United States is increasing its spending faster than other countries. So the data clearly indicates that as a percentage of GDP, and percentage of Income, the US healthcare costs are the highest in the world by a large amount. The rate of those is climbing faster than any other country in the world. So we pay the most, but we have the best care, correct? Well, according to the data, that is not a true statement. 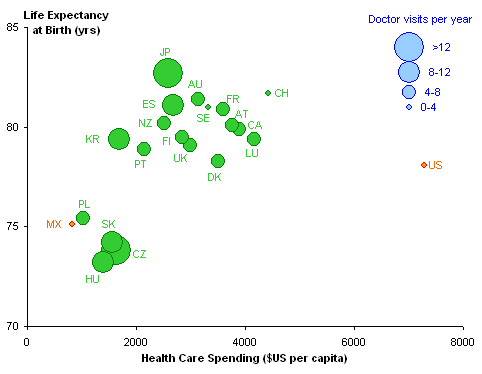 We see the doctor the least, our cost is the highest and our life expectancy is below the average. 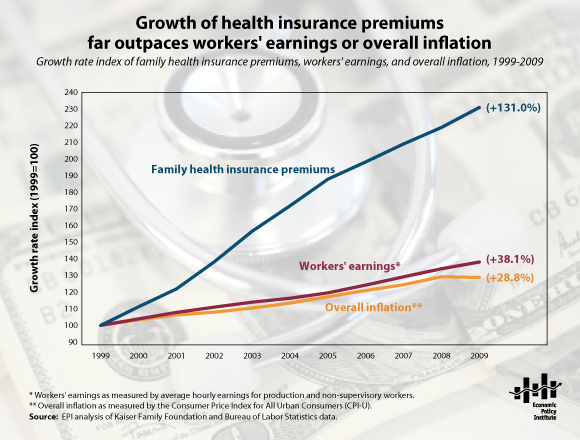 The least efficient payers in the world are American private insurance companies with administrative costs of 20-30%. Just 5% of Americans accounted for half of all US health care costs in 2009. In the UK, the Brits spend about $3,500 per person on health care. The US spends around $8,500 per person, yet the British have a higher life expectancy then Americans. 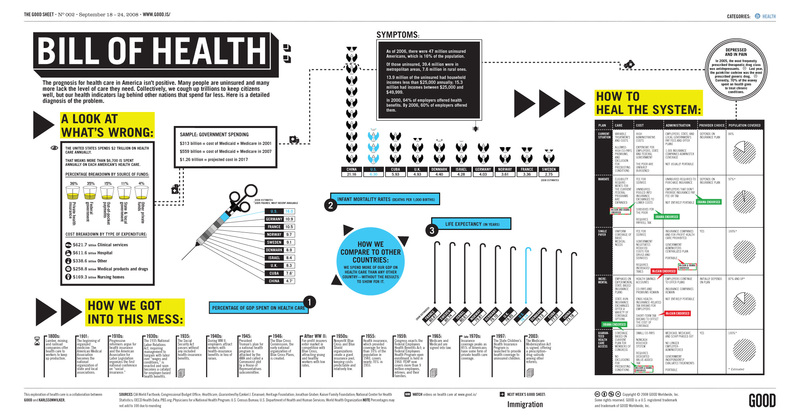 OK, so clearly the US has a real problem in controlling healthcare costs. Most of all the industrial countries in the world have a “single-payer” system, which means people pay taxes, and the government provides the healthcare. Americans call “single-payer” a socialist program, big government and bad service – even though all the charts above, especially the per capita vs. life expectancy show that this is not a true statement. American insurance administration cost are 20% to 30%. 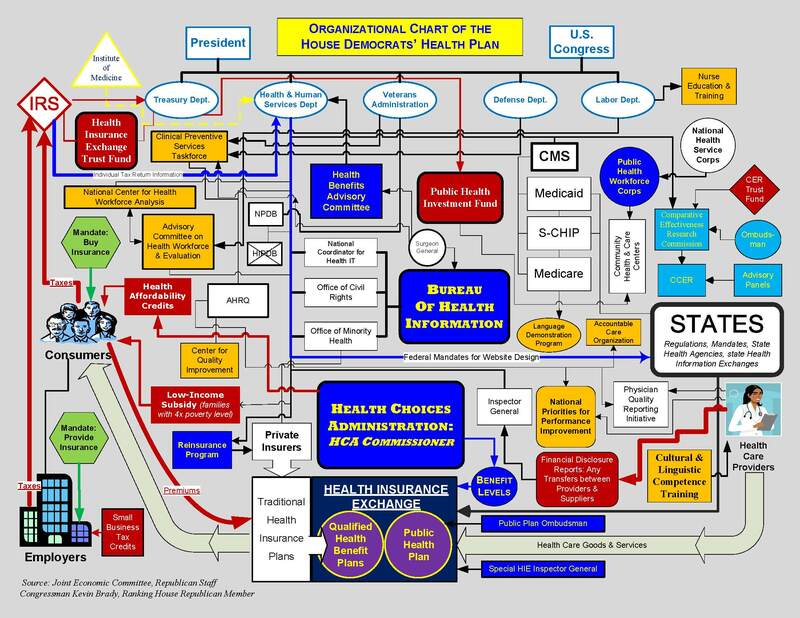 Remember, the US healthcare system is a “for profit” system. 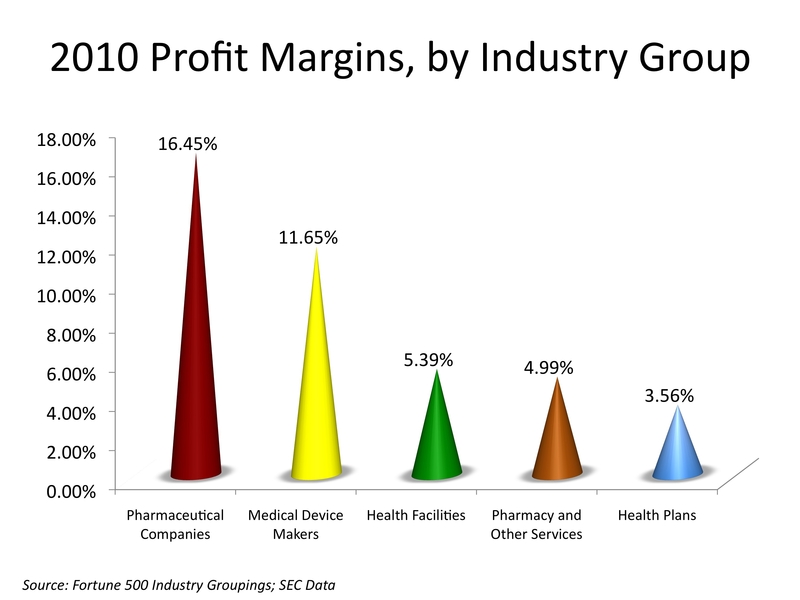 Now, the profit margin for healthcare companies is not as great as most people expect. The numbers look small, but lets look at it a little closer. Let’s say you went to the hospital, and after you had to buy a medical device and had to go on medication. Let’s say the total cost of you health care that year was $100,000. How much of that went to profit? Well, your healthcare insurance was 3.5%, and the pharmacy and hospital was 5%, and your home medical equipment was 11.5% and your meds had a 16% profit. That means there was a cumulative profit of 36% for your care. Of the $100,000 of healthcare cost, $36,000 went for profit. So the profit in the US Healthcare system clearly makes it more expensive than any other county. So, how does our “for profit” healthcare effects average Americans? We love our ‘for profit’ capitalistic healthcare system of patriots, but we pay the most for it, visit the doctor the least, and have below average life expectancy. A large percent of our healthcare costs go for profits and insurance administration cost. Conservatives say that big government, higher taxes and single payer system would be worse – but every other industrial nation in the world has lower costs and higher life expectance with their single payer system. 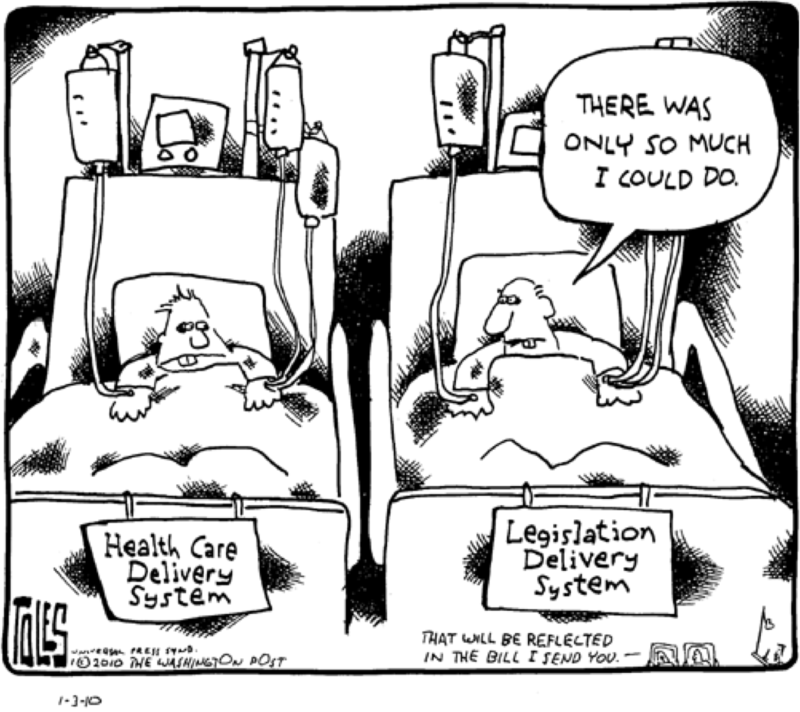 At the rate we are going, healthcare is going to bankrupt our country and our citizens. Everyone loves Medicare, so why not make it for everyone? Oh yeah, the for profit health industry who pays for our elected officials to win their elections, dose not want to be controlled and limited in order to lower costs and make America and Americans safe from bankruptcy. Remember, protecting profit is more important then protecting life, right? So what if some people can’t afford life in our “for profit” healthcare system, if they can’t afford to live, they shouldn’t, right? Is that really what being a patriotic, conservative, capitalistic American really means? This entry was posted in Business, Life and tagged costs, for profit, gdp, healthcare, insurance, profit, single-payer by pusz4frog. Bookmark the permalink. Error in your article needs correction! This is an inaccurate calculation of total profit. You can’t just add up the profit percentages! You must multiply the individual percentages buy the individual costs then divide by the total cost. I don’t have the individual costs for each of these items but I think you will find the average profit will be under 10%. This is very representative for most companies in the US. I am a soon to retire individual and I do think we have a problem with our total health care costs in our country. A major contributor to our costs is poor preventive medicine on the consumer’s part. We don’t go to the doctor enough, nor take their advice and participate in high risk lifestyles then expect instant cures, pills and surgeries. We are an innovative people and have found costly procedures to extend life that we didn’t have decades ago and people feel entitled to every benefit without regard to cost since it’s paid for by Medicare. Every year we spend more than is received/budgeted for it. With regard to 20% administrative costs, Medicaid/Medicare admin ~7% BUT nearly 25% of their total costs are from fraud! In a private market this is controlled for profits hence higher admin costs. A much more efficient use of funds.